United Way of Long Island through its ‘Switching Gears’ program, has provided a recent YouthBuild Long Island graduate Christopher with his own transportation. The program, funded by the generosity of the Island Outreach Foundation, enables students the opportunity to own an affordable and reliable pre-owned vehicle, at no cost. Eligible students who meet specific criteria must write a one-page essay describing why they deserve to receive the vehicle, and their long-term plan to maintain and care for it physically and financially. The program came at the perfect time for Christopher, who works as a Process Operator at Estee Lauder and has to travel the extensive distance from his home in Wyandanch to his job in Melville. Christopher has held this position after earning his high school equivalency diploma and graduating from YouthBuild with the Directors Award in 2016. Christopher’s experiences with YouthBuild allowed him to secure a career path with the potential for growth and the possibility to climb the corporate ladder toward financial stability. The commute to work, however, presented problems for Christopher, as it was not only time consuming, but he was also at the mercy of unreliable public transportation. Participants in the program receive a warranty that includes yearly maintenance on the car and membership to United Way’s ‘Car Club’, which helps to educate the recipients on how to care for and maintain their vehicle and provides access to supportive services and referrals. To learn more about YouthBuild Long Island visit http://www.unitedwayli.org/youthbuildli. Meredith, who joined United Way as an intern for the summer, reflects on her recent attendance at a BeReadyLI Children’s Workshop. As a summer intern at United Way of Long Island, I was recently able to visit Hewlett-Woodmere’s Franklin Early Childhood Center to watch and learn about the BeReadyLI Children’s Workshop presented by United Way and partner PSEG Long Island. When the children were asked if they knew their full name and the full name of their parents, I was shocked to see how few knew the answer. Most of them responded “mommy” or “daddy” when asked their parent’s name. Their answers showed how important it is to teach young kids the information they’ll need to know in an emergency. Because of PSEG’s partnership with Sesame Street to create a “Let’s Get Ready” initiative, the students learned valuable information while watching videos of their favorite Sesame Street characters. They clapped along as Grover and Rosita sang songs about special helpers, like firefighters and police officers. It was clear that the interactive nature of this workshop made it easy for the students to soak up all the information. One of the most entertaining parts of the workshop was when the students were taught how to make a “go pack”. This “go pack” is full of essential items to have for emergencies. The students were given clues as to what was in the “go pack” and had a blast shouting out the answers. They laughed with their friends, shouting “No!” when asked if a piñata should go in the “go pack” as well. The workshop concluded with student volunteers putting on hard hats and assisting in holding up big letters that represented the safety slogan. The four students picked were more than excited to run up to the front of the room. I, along with the faculty and teachers, had a great time watching students repeatedly call out “be Prepared, be Safe, in an Emergency, Get ready” to remember the four things they need to do in case of an emergency. After assisting during the program, MaryGrace Macavoy, an intern in PSEG Long Island’s Community Partnership Program said, “the [BeReadyLI] program is very educational and it is great that both companies are coming together to teach kids at a young age.” MacAroy said that since PSEG Long Island is a family oriented company it is important for them to help keep kids safe. The students were thrilled to learn they were going to be able to take home a goodie bag containing an activity book, crayons, and a safety certificate. It also contained more information about 2-1-1 Long Island that they could share with their parents to prepare the whole family for emergencies. After watching the workshop, I was pleased to see how much the students enjoyed learning what to do in an emergency. The workshop was entertaining and taught them a lot of information they need to know. 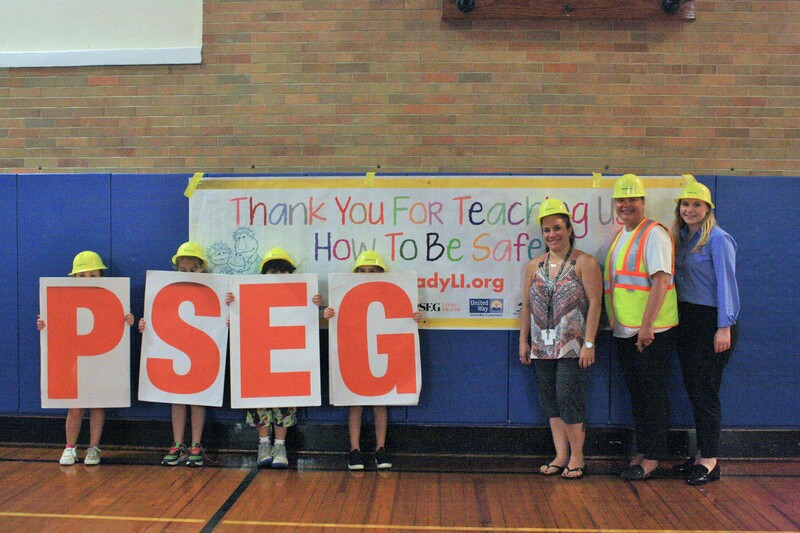 Thanks to the partnership between PSEG Long Island and United Way, the students and their parents now have the information they need to be safe in an emergency. 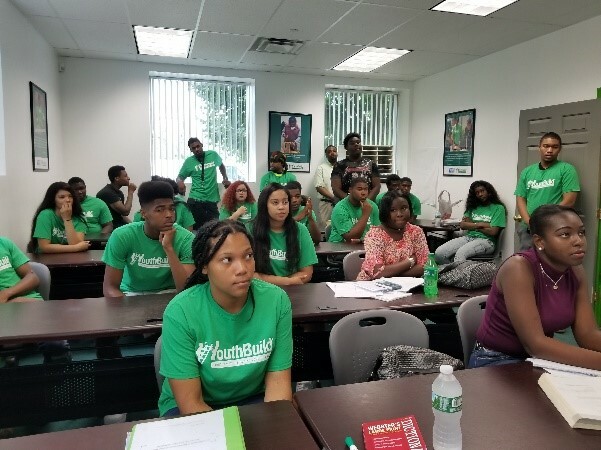 Brian, Educational Consultant and Recruiter for YouthBuild Long Island, looks ahead at what’s to come for the students enrolled in the YouthBuild Summer Program, based in Bellport. YouthBuild’s Summer 2017 kicked off July 5th with a community celebration at the Boys and Girls Club of the Bellport Area. 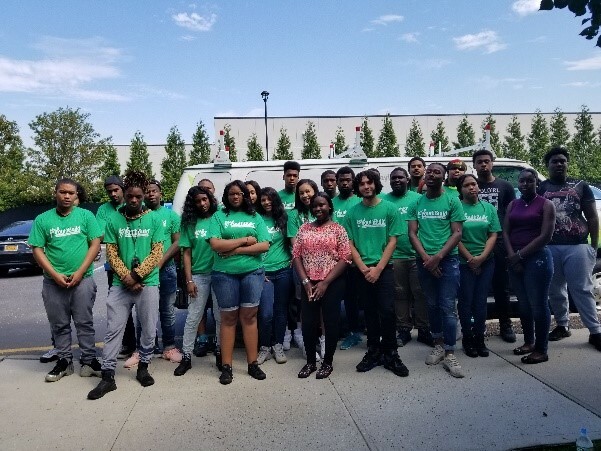 For a second year in a row, made possible through support from Island Outreach Foundation, YouthBuild Long Island’s summer Bellport program offers young people, ages 18-24, a fun, innovative, and enriching way to spend the summer months. Students will partake in educational and engaging activities, while also participating in internships that will give them a chance to explore different career opportunities and have meaningful job experiences. Through YouthBuild Long Island, local businesses and organizations collaborate to create a life-enhancing learning atmosphere for students. Summer field trips started with workshops at Theater 294, introducing the students to the different facets that come together to create a theater production. Next, students will visit Adventure Park where they will engage in high and low rope course exercises that will help develop team-building skills. Other trips include a visit and tour of Sony and Apple Stores as well as Fox News Studios in New York City. Over the course of the summer, students will understand the importance of education as they prepare to enter the workforce. United Way of Long Island has partnered with Journey of Difference to lead career readiness workshops that will cover important topics including goal planning, time management, professional behavior, confidence, communications and power of listening. In addition, partnerships with local businesses and organizations offer students internships throughout Eastern Long Island. Companies and organizations including Long Island Head Start, Habitat for Humanity of Suffolk, Boys & Girls Club of the Bellport Area, H&W Staffing Solutions, and the South Country Library are all part of this initiative. The goal of these internships is to help students identify their own aspirations for the future, expose them to different careers, and ignite, within themselves, ideas of careers they would potentially want to pursue. Through the summer program, these students are building the foundation they need to begin on the path toward a successful life. We look forward to watching them learn and grow. Geselle, joining United Way for the summer as an intern through The Jaggar Community Fellows Program at Adelphi’s Center for Career and Professional Development, reflects on her experience volunteering with United Way at the Islip Arts Council Concert in the Park. Part of being an intern at United Way of Long Island is to be a part of a huge team of employees, managers, and volunteers that work together to help our community. Never did I think of how big my team really was until I volunteered at Islip Arts Council’s Concert in the Park last weekend. On a sunny Saturday evening, after a near hour-long trip from my home to Heckscher State Park, I was met with crowds of concert-goers arriving to the event and already setting up to see the show. The same amount of excitement went for the organizations, including the Islip Arts Council and United Veterans Beacon House, that were setting up their booths all around the field, as I quickly saw hundreds of volunteers pitching up the tents and setting the tables before the main event, and the United Way/Mission United team were no exception. In fact, they were almost done. Being among all the activity, I immediately went to work finding anything I could help with: setting up signs pointing to our booth, putting up tables and placing everything on them, including Mission United T-shirts, as well as donated giveaways such as small fans, energy efficient lightbulbs and camouflage drawstring bags. I even built a Spin-to-Win wheel for the contest booths. I saw familiar faces from United Way, and met more than 70 volunteers hailing from companies all over Long Island including PSEG Long Island, Capital One, Enterprise, GEICO, Suffolk Transportation Service, Inc., Target, UPS, IRS and Petro/Star Gas/Meenan, all of whom were dedicated in helping out and working together with the set-up. It was inspiring to see so many people from so many different places coming together in support of an important cause. About an hour before the show began, I was settled in a booth with Biena who I have been working with at United Way, where we were in charge of offering Mission United shirts to attendees for a small contribution, as well as managing one of the Spin-to-Win games and raffle for a military-style backpack. It was great seeing Long Islanders of all ages arriving to wear one of our shirts, as well as families and kids coming over to play the games where more than half of the players won a drawstring bag, which everyone enjoyed! It was near dusk when the Long Island Concert Orchestra, led by David Stewart Wiley, kicked off their performance with a plethora of classical and contemporary scores. It was a sight to behold, seeing a stage full of bright lights occupied by what looked to be a 100-person orchestra, in front of thousands of people watching the show in near-darkness. For everyone and myself, the live music was a pleasant treat, with many of the songs displaying good old-fashioned Americana. Near the end of show, their performance was accompanied by a visual and booming spectacle of Grucci fireworks, which were so up-close that they almost lit up the sky with colorful sparkling lights. The best part about Concert in the Park was not just the concert orchestra or even the fireworks, but the fact that I, along with everyone else there, was able to contribute to supporting Long Island’s veterans and their families. We were able to raise funds in support of the Mission United initiative, which helps veterans transition back to civilian life through a network of partner agencies offering critical programs and services. Not to mention because of our participation and the help of all of the volunteers, everyone that was there was able to learn about the initiative. In addition, it was the official public debut of our Healthy Homes Vehicle generously donated by National Grid, which will be utilized by veterans as they build and retrofit homes across Long Island into safe and healthy places for individuals and families to live. The entire night was a remarkable dedication to our Hometown Heroes. It was remarkable to see the amount of effort that the Islip Arts Council put into putting on an incredible show and how I witnessed this great partnership. That night at Heckscher State Park reminded me of how big a team I was truly a part of as an intern at United Way of Long Island, as well as how great their efforts were as they worked together. I’m more than grateful to be a part of the United Way team. June is National Healthy Homes Month. Geselle, joining United Way for the summer as an intern through The Jaggar Community Fellows Program at Adelphi’s Center for Career and Professional Development, reflects on what a healthy home is, and why it is so important to ensure that your home is healthy for your family. How much of your everyday life do you think you spend indoors? According to United Way of Long Island Senior Vice President of Housing & Green Initiatives, Rick Wertheim, the answer is a staggering average of 90%. A large percentage of that time is spent inside your home, but for as much time as we spend inside our house, we rarely acknowledge the potential dangers that may reside right alongside us. These overlooked offenses often give rise to a slew of other problems that threaten the health of not only our homes, but the health of our family. To raise awareness for this prevalent problem, June is recognized as National Healthy Homes month – a time to learn the value of maintaining a healthy, environmentally friendly home. Of course, the question is: what makes a home “healthy”? Believe it or not, about half a million homes on Long Island have at least one indoor environmental hazard. These hazards include the likes of mold, lead and asbestos. Unfortunately, issues like this toxic trio can have a serious effect on the wellbeing of those living inside. Studies conducted by the University of Warwick and the University of Brighton revealed a direct link between housing quality and resident health. Respiratory illnesses, asthma, eczema, strokes and even cancer have been proven to be connected to the way a home is maintained. Additionally, physical damage such as water leaks and electrical deficiencies are known to put residents at risk of physical injuries like bone fractures and burns. Coupled with Long Island’s susceptibility to high coastal humidity, seasonal floods, hurricanes and winter storms, these misfortunes threaten to spell disaster for many residents. Healthy homes are those which not only keep their residents free from risk of illness and injury, but also provide a reliable shelter in the face of natural disasters. Oftentimes, having a healthy home requires little more than routine maintenance and inspection. From clearing out unnecessary items with daily 3-minute clean sweeps to testing your smoke alarm, it takes only a handful of habits to maintain a home that is healthy, durable, and sustainable. Other methods include using borate treatments in place of pesticides for pest and vermin control, and using damage-resistant material like paperless gypsum drywall for flood resistance. Many underestimate the importance of ensuring their home remains safe and sanitary. That’s why the United Way of Long Island’s Housing and Green Building department works to both promote and create high-performance, healthy homes for residents across Long Island. By collaborating with various agencies, and offering courses at our E3 SmartBuild Training Center, United Way provides healthy homes for countless individuals and families, including veterans and those with special needs. For more information on how to retrofit your home into a healthy home, or if you want to learn more about United Way’s Housing and Green Building department, go to www.unitedwayli.org/HealthyHomes. “I grew up in Brentwood, Long Island and lived there for most of my childhood life. When I was 10 years old, my brother’s life was taken by a gang – He was only 19 years old when he died and today he would have been 38. He was my closest brother and the closest thing I had to a role model. I am the youngest of 6 children. My father only spoke Spanish and I never learned how to speak it. My mother was the only true positive support I had. She took me to church three times a week and I would lay on her lap in the second row, tired and confused because I did not understand what the pastor was saying. My oldest brother was in the military as a Marine. My second oldest sister used to bully me, my youngest sister was extremely shy and the oldest was the only one who took me out of the house from time to time. We did not have a lot of money. We owned a wood-grain station wagon and we called ourselves “The Brady Bunch”. When my brother died, I ended up feeling alone. As I got older, it was too easy for me to end up getting involved with the wrong crowds, and I would do anything just to gain respect and make friends. Those times later defined my future. I am not proud of anything I did back then. I was very vulnerable, but I would continue to prove myself. With my brother’s death on my conscience, I swore to myself that I would never, ever join a gang because I knew that I would end up in one of two places – dead or in jail. I was in the system and no matter how much I tried to turn my life around, I was still looked at as a rebel. Even after I had a child, I was still doing things that would later ruin my life. Until I found YouthBuild Long Island. The mother of a friend of mine saw me struggling and told me about the program. When I researched it, the first thing that came up was a boot camp. Kids marching, sweating, chanting, and I immediately turned it off and I told myself that I would never, ever be one of those kids. She was extremely persistent and so she bribed me with lunch (at that time I had a large appetite so I was easy to manipulate). I showed up to orientation and I met Elizabeth Morgan for the first time. Just witnessing her passion made me feel reassured. I also felt this strange positive vibe in the air that was very unfamiliar, but it felt good. I was surrounded by kids with dreams, kids who needed a change, and kids heading down that one way tunnel and knew it; kids like me. During my stay at YouthBuild, I went to two boot camps, visited different boot camps and encouraged my peers. I even went to a staff boot camp. After graduating YouthBuild in late 2011, I was hired at United Way of Long Island in 2012. With the support of the United Way staff and YouthBuild staff, I was able to shine and make a career for myself in green construction. I’ve now have the honor of training the YouthBuild and VetsBuild students for a living. Best of all, I’ve been able to pay it forward by working with contractors in rebuilding neighborhoods out in Brentwood and Central Islip. I was the first on Long Island and the first YouthBuild student ever to be awarded the Building Performance Institute’s Home Energy Professional Retrofit Installer certification. My name is Freddie and I am a proud 2013 graduate from United Way of Long Island’s YouthBuild program. I was born and raised in Washington Heights, my parents are from the Dominican Republic and my home life was always chaotic – especially with three older siblings. I had the privilege of attending Brandeis High School on the Upper West Side but did not recognize the advantage this would have given me in life. After only five months, I was kicked out and told that someone who wanted the opportunity to learn would better fill my spot. At the time I did not mind. I was lazy, never wanted to go to school and only cared to be around people who were like me. Since I wasn’t in school anymore, I resorted to making money on the streets and was arrested. I served a year and a half in prison. I was miserable. The sun rarely came out. The days were dark, the lights were dim and the jail was cold. I spent each day there knowing that I had to do better than this life. I hurt so many people coming to prison, including my girlfriend Erica. After my release, I was paroled to my father’s house in Wyandanch. My parole officer told me about YouthBuild, and Erica encouraged me to join. She had aspirations to make something of herself and I knew if I wanted to be with her I had to stay away from the streets and start doing something with my life. After visiting YouthBuild I was excited to hear about how I could earn my TASC diploma, but unfortunately the rigor of the program proved to be too much for me to handle. I quit. Again, I was presented with an opportunity and let it slip away. I came to my senses and enrolled in the summer TASC program. I came to class every day, and was able to see all the great things that United Way and YouthBuild were involved in. After the summer, I took the TASC test and passed. This was only the first step – I wanted a long-term career not a short-term fix so I enrolled in the full ten-month program. During this time, I learned and did more than I ever thought I could. I volunteered with several agencies, learned leadership skills, attended events, received hands-on training while building a house, and received my OSHA 10 certification and the National Home Builders Institute Pre-Apprenticeship Certification. I was determined to make the most of this opportunity, so after I graduated I asked to learn more about the Electrical Training Center who I saw working at the E3 Training Center. I went on a tour of the facility, and knew that I wanted to be an electrician. All I had to do was attend and pass the class. The price for this class was out of the range of possibility for me, until I received a scholarship from United Way. I was so grateful and promised to make United Way proud of me. I passed the course and immediately started my career at Statewide Electric and Communications. I later left to work with Premier Solar Solutions and I am now happily employed by SunPower by Empower Solar, where I have worked as a solar installer for over two years. At 27 years old I am finally truly happy. Erica and I are now married; we live in Great Neck and are expecting our first son. Now, the sun is always shining and I will forever be grateful to United Way and YouthBuild for supporting and guiding me over the past four years. The amount of support I have received is priceless and I will forever be appreciative.